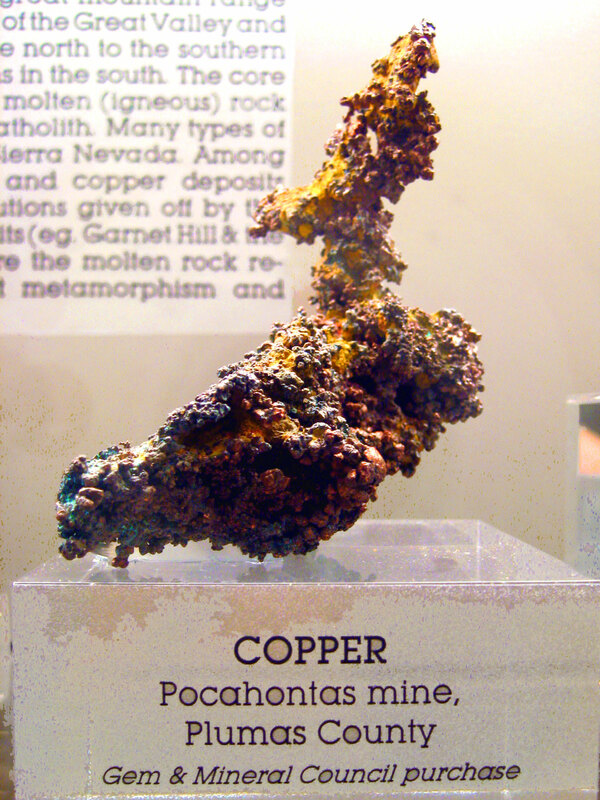 At the Denver Mineral show, we put together an exhibit related to the color of copper. You already saw pictures, but here is the poster that was associated with our display case. As you will see, explaining the color of copper containing minerals is sometimes not that straightforward! The color we see for an object is the result of the interaction of visible light with that object. Visible light is made up of violet, indigo, blue, green, yellow, orange and red (the spectrum, or “rainbow”), from high to low energy (= low to high wavelength). The color of a material results of the absorption of some colors by the material, the color seen is therefore the color not absorbed (= transmitted). For example, if the blue/green/violet colors are absorbed, the color seen is red/orange. Nassau (1978) reported 15 different ways light could interact with a material to give rise to color. Copper by itself can give rise to its various colors, blue, green and red, through at least 4 different ways that are reported here. Copper as a metal and semi-conductor: the red color. The nature of the red color from this group can be explained by the band theory. It is a complex theory, involving quantum effects where the energy levels of some electrons are stretched into bands. There is the ground state (or valence band), which represents the normal energy of the electrons. There is also the conduction band, which is a higher energy level where the electrons are more mobile. In metals, the valence band merges with the conduction band, the electrons are therefore in a common pool, allowing them to move throughout the metal. This causes properties such as a metallic luster, a high electrical conductivity, and other traits found in metals. 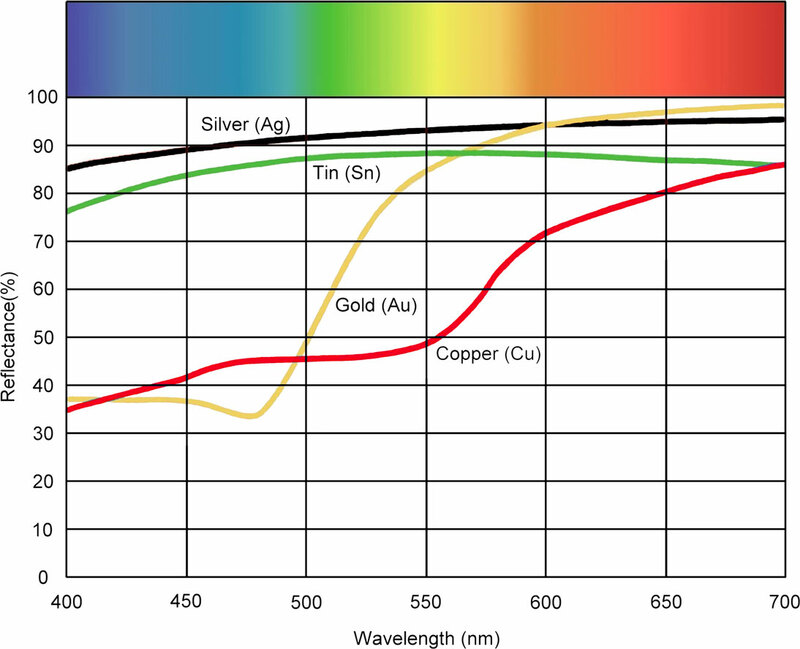 The surface electrons can absorb light of any energy, but they reemit it; the efficiency of reemission produces the colors, such as the red color for copper (see figure below). In semi-conductors, there is a gap between the conduction and the valance bands. Light with energy greater than the band gap will be absorbed, moving electrons from the valence band into the conduction band. For example, if only the high-energy light (blue - violet) is absorbed, the color seen is red to yellow, which is the case for cuprite. 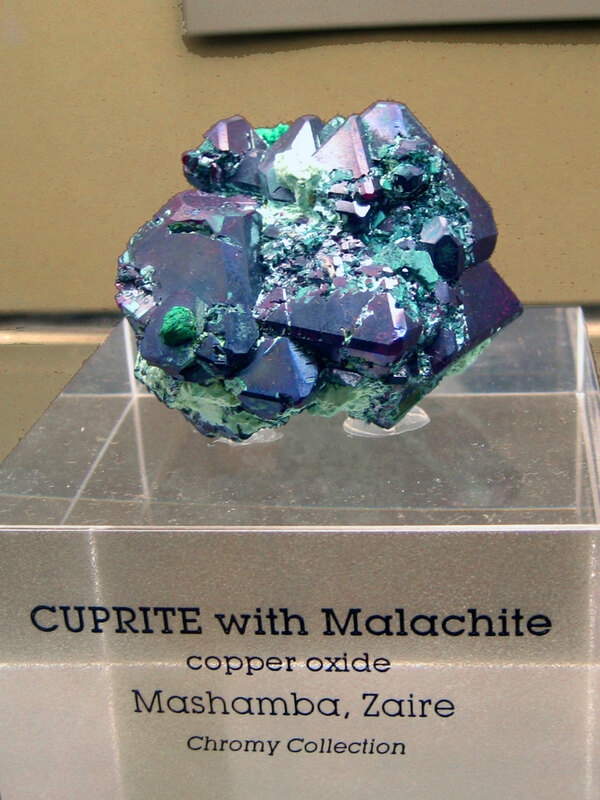 Copper, as a metal (Cu0), has an extremely high reflectivity, with a maximum reflectance in the red, leading to its reddish color. 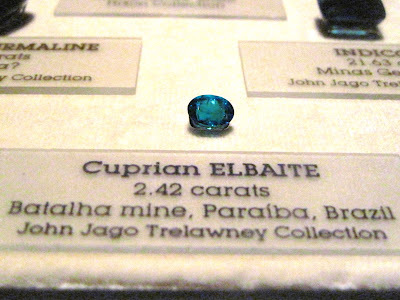 Copper as transition metal: the blue and green colors. 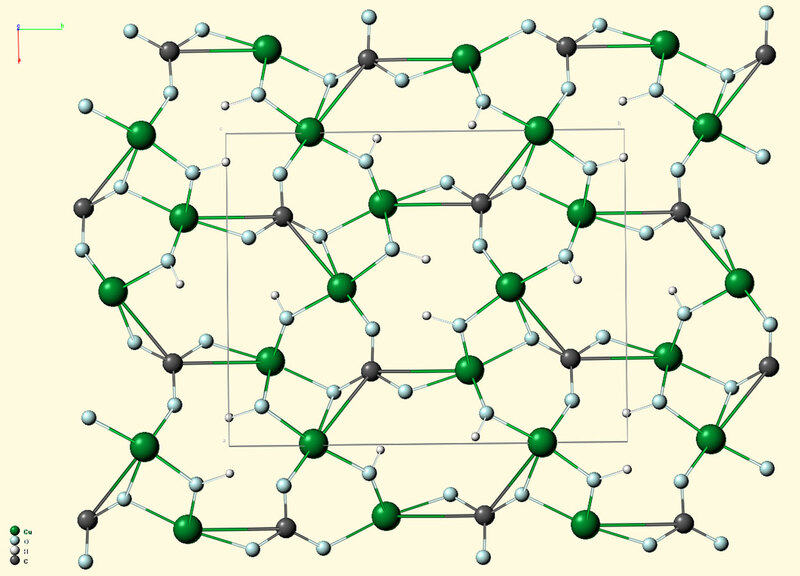 In this category, Cu2+ is responsible for the color. The nature of the color can be explained through the ligand field theory. Here is an easy way to present it: Electrons usually travel in pairs. For transition metals, such as vanadium, chromium, manganese, iron, cobalt, nickel, and copper, the formation of ions leaves lone electrons behind. These unpaired electrons may absorb energy (i.e. color) from any incident light in order to satisfy its need for companionship. The energies not absorbed cause the color observed. The typical colors seen may depend on the valence state (the electrical charge) of the ion. In the case of Cu, the 2+ state gives rise to the blue or green color (while +1 state is typically colorless). Why in some cases Cu2+ gives rise to a blue color (e.g. 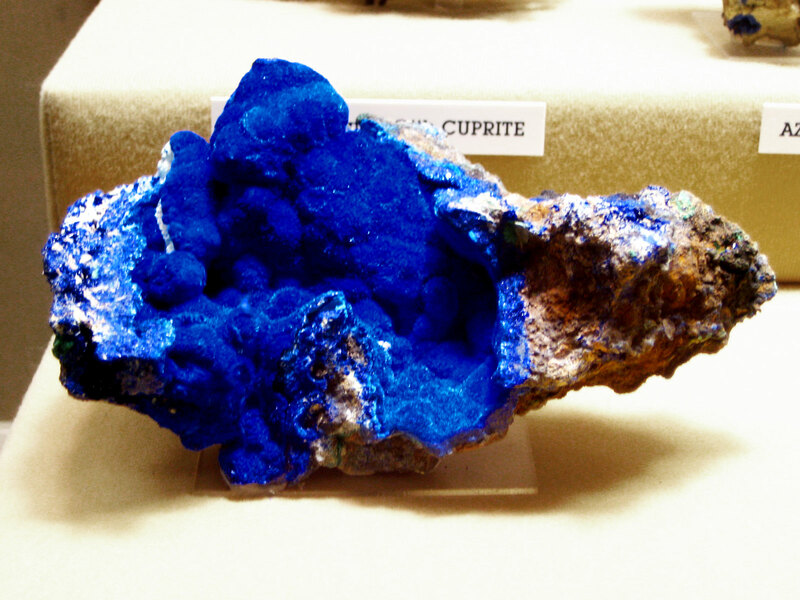 azurite), while in some others, it gives a green color (e.g. 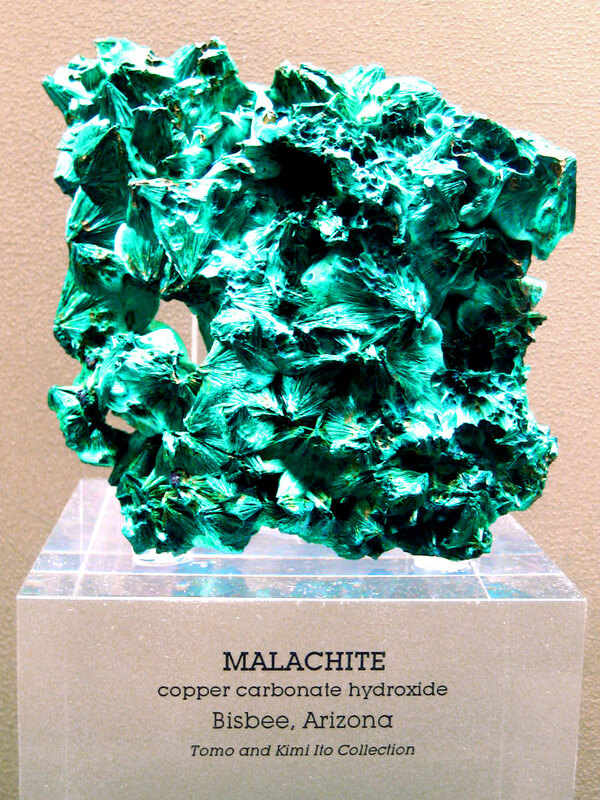 malachite)? 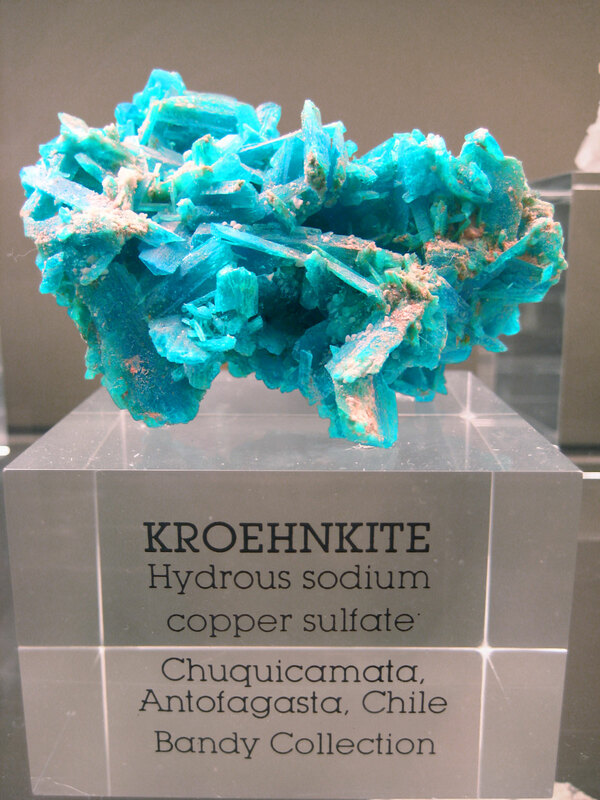 Notice that azurite has fewer OH groups attached to each copper atom than does malachite. 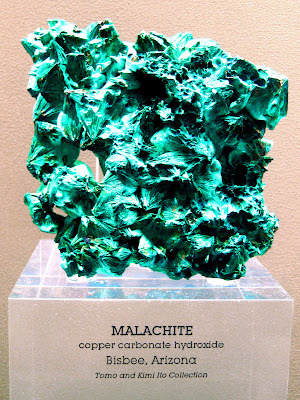 The latest theory is that the electrostatic charge from the OH- differs from the charge from the O2- ions; that, in turn, changes the energy levels of the copper which shifts the absorption region to a small extent (maximum transmission around around 450 nm for azurite and 520 nm for malachite). The human eyes are very sensitive to such changes in the blue / green area of the visible spectrum. Atomic structure of azurite (source: webmineral). Green: copper: black: carbon; blue: oxygen; white: hydrogen. 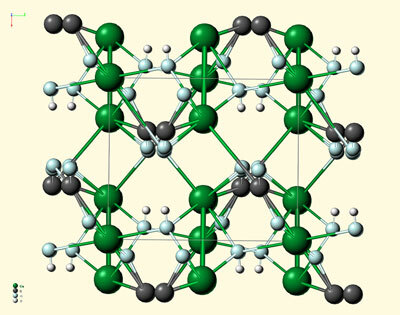 Atomic structure of malachite (source: webmineral). Green: copper: black: carbon; blue: oxygen; white: hydrogen. 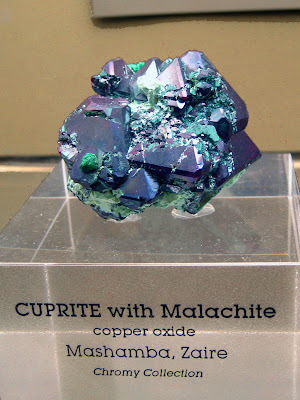 Copper can either be a major component in a mineral or a trace element, also referred as impurity (usually ≤ 1 %). When the coloring agent, here Cu2+, is part of the mineral formula, minerals are referred as “idiochromatic minerals”. 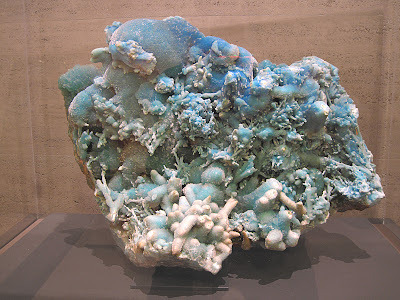 That is the case for azurite: Cu3(CO3)2(OH)2, malachite: Cu2(CO3)(OH)2), turquoise, caledonite, ajoite, dioptase, rosasite, etc. When an impurity causes the color, it is refer as a “chromophore”, and the minerals as “allochromatic minerals”. 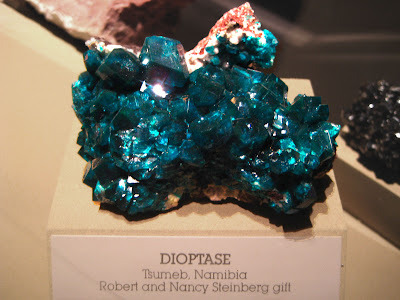 The chromophore element does not appear in the mineral formula, and without any chromophore, the mineral should be by definition colorless. 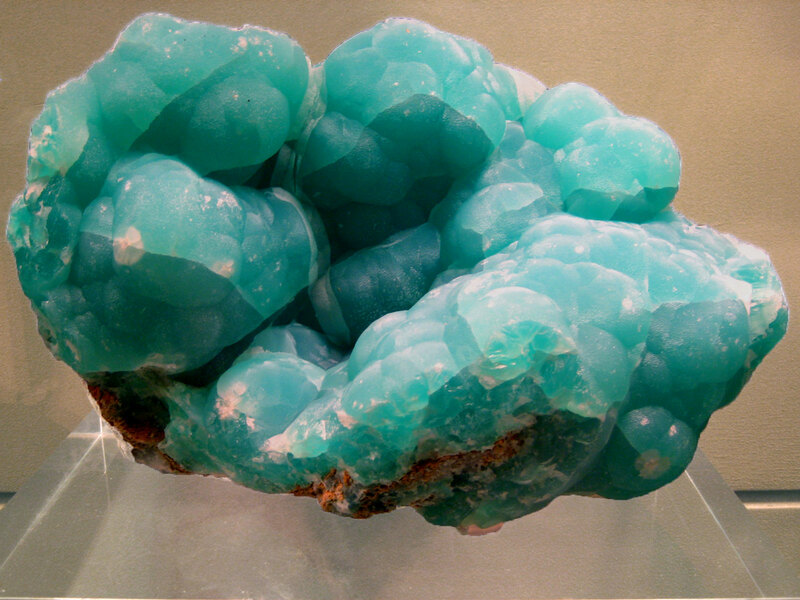 Copper is a chromophore in many minerals, such as blue smithsonite, aragonite, opal, Paraiba tourmaline, etc. From the Schiller effect to the green to the red colors, all are caused by copper in the Oregon sunstone (labradorite feldspar). More precisely, they are due to the exsolution of copper present in impurity during the cooling stage of the feldspar. In the areas of the feldspar where the copper content is the highest (we are talking about up to three hundred part per million atoms -ppm- of copper! ), platelets of about 10-20 µm of metallic copper (Cu0) formed, which are the Schiller copper plates on which light reflects to create the reknown shine. 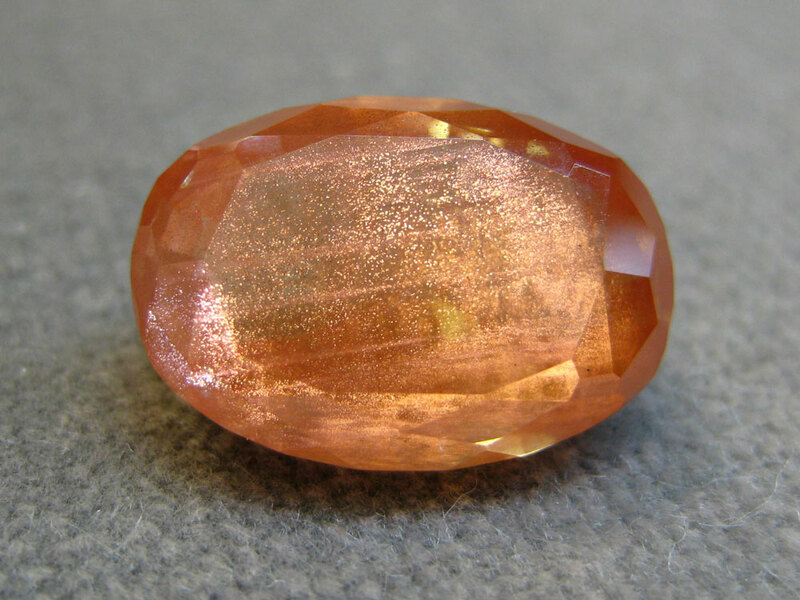 At slightly lower copper content, the sunstone will have a red color. In this case, it has been recognized that the color comes from the intrinsic absorption (at 560 nm) of metallic copper (Cu0) particles too small to diffract light (4 - 22 nm in size). At even lower copper content (about 100 ppm), the sunstone will have a green color. Even if the involvement of copper is clear, the cause of the green color is still not fully understood. One hypothesis under scientific investigation is that the green color results from a charge transfer between Cu0 and Cu+. Colorless areas are copper free. 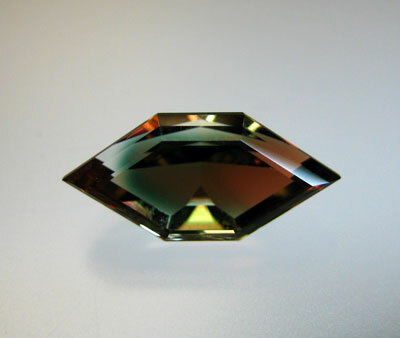 A 4.32 ct Oregon sunstone displaying the range of color from colorless (no Cu), to green (Cu0 - Cu+charge transfer? ), to red (Cu0 colloid, 4 - 22nm in size). A 11.32 ct Oregon sunstone displaying the Schiller effect, due to metallic copper laths of 10 - 20 µm in size reflecting light.